Under yet more grey skies I crossed the Pont d'Aquitaine and followed the wrong signs, approaching St Emilion via central Libourne. The town's nice enough, but it wasn't the route I had anticipated. Nevertheless (a word as pleasant to say in French - néanmoins - as it is in English), I arrived but two minutes late for a rendezvous with a French-dwelling wine merchant friend and we headed up to Ausone together. The wines were mostly very good, with proper leaps up the quality ladder sample by sample. 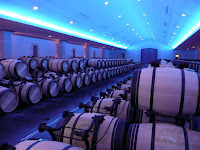 From there, we made our way to Chateau La Gaffelière, where was taking place a tasting called La Grape, that consisted of all the wineries for which Stéfane Derenoncourt consults. I had not realised quite how widely this masterful wine maker spreads himself, but if I tell you that there was even a couple of wines from a producer in VA, USA, you'll get the picture. There were a great many good wines here and some will appear on our forthcoming offer. 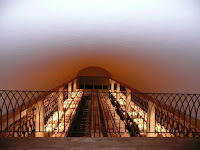 I continued on to Château Jean-Faure for a nose around. This property changed hands 5-or-so years ago and the quality is now exemplary; as it should be, as its vineyards lie in that golden triangle that includes Cheval-Blanc, Evangile, Vieux Château Certan and Pétrus. I'd already sampled the '07, so we enjoyed a glass of the 2005 before cracking on to Château La Couspaude and the St Emilion tasting. I have to confess that I picked and chose somewhat. I just didn't have the time to taste through all the wines that were being presented at this leviathan of a tasting. 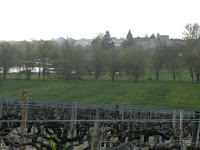 From there, it was on to taste the Pomerols at Château Petit-Village. The Pomerols are really pretty consistently good this year. Lastly, I headed to the Cercle Rive Droite circus. This is a vast event, at which one has the opportunity (if suicidally minded) to taste 125 wiues from all the Right Bank appellations. I was circumspect and I found some very good - and good value - wines. Details will, I am sure, follow. Just time for a quick beer in St Emilion and then a dash to Mérignac and the flight home.